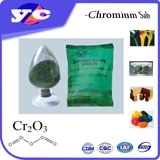 Chrome Oxide Green Suppliers, Chrome Oxide Green Manufacturers. Uses : Pigment, paints, metallurgy, fire resistance, polishing material and so on. Product description: Chrome oxide is a green crystal powder, metal luster, magnetic, good covering strength, high-temperature-resisting and sunlight fastness. Not soluble in water, barely soluble in acids, comparatively stable in air, unaffected by acids and alkalis of common density, sulfur dioxide, sulfur hydrogen etc. Chrome oxide green enjoys excellent quality and firmness of coloring.